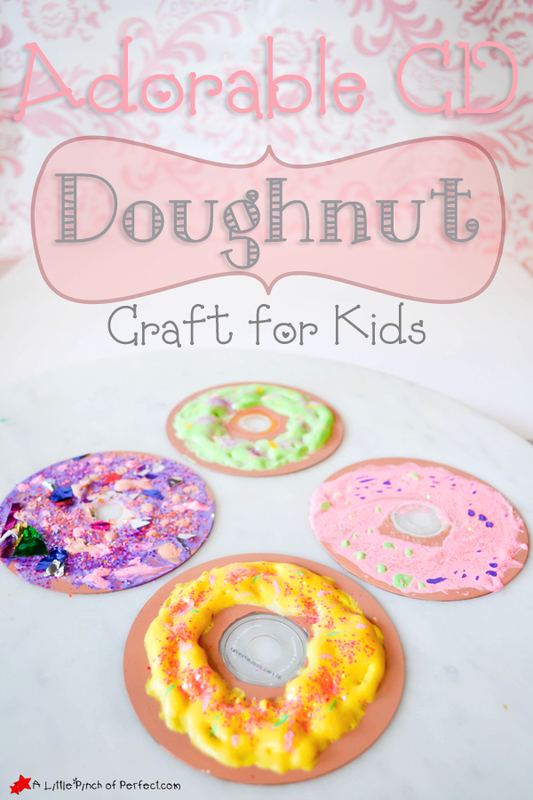 We turned a CD into an adorable doughnut craft with homemade puffy paint frosting. 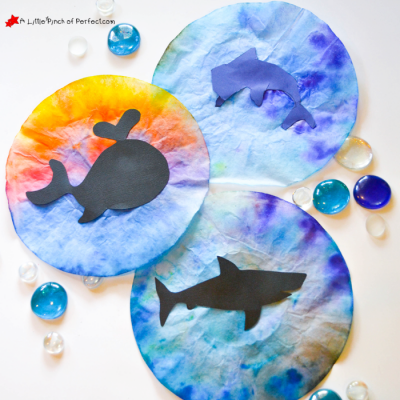 We love Recycled Crafts, so when the Kids Craft Stars challenge this month was to craft with CD’s I was thrilled. 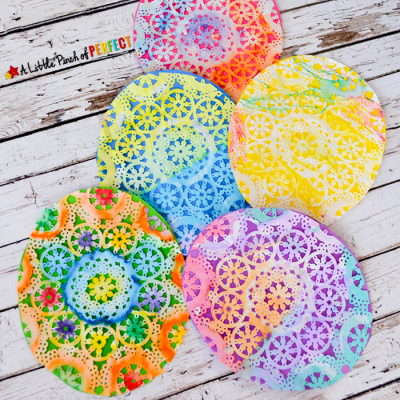 We have never crafted with a CD before and painting on new materials is always fun! 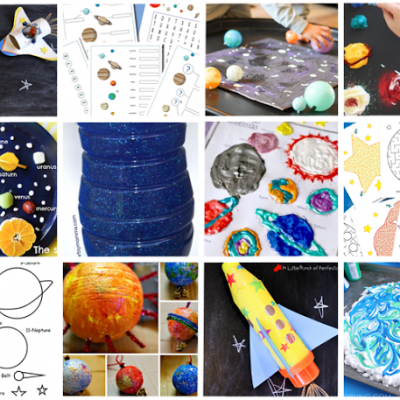 You can follow the Kids Craft Stars on Pinterest and Instagram to make sure you catch all the cute crafts our team comes up with! 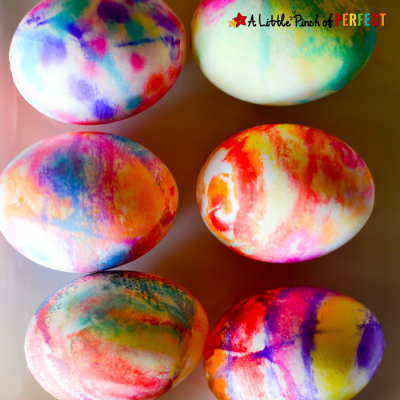 If you wanted, you could skip the puffy paint and just use acrylic paint. 1. Paint the CD brown and set it aside to dry. We didn’t have brown paint so I used red, green, and yellow to make a doughnut color. Our CD’s had designs on the front of them so we painted the shiny side. 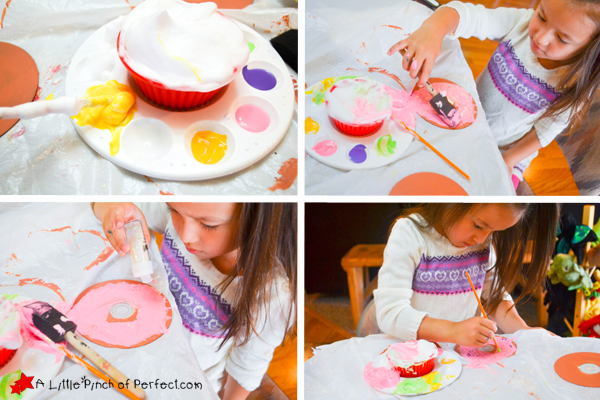 When ready to paint the doughnut, mix 1 part glue to 1 part shaving cream to make the puffy paint. 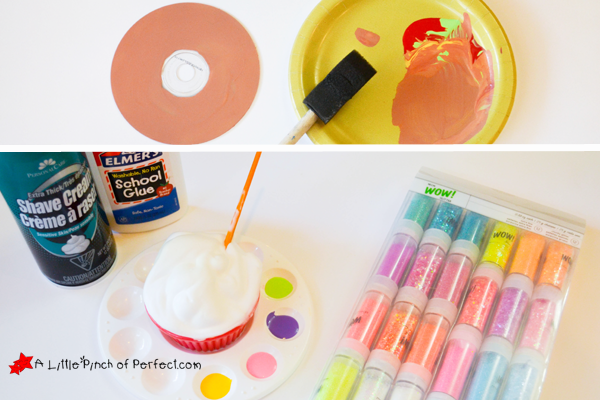 Divide the puffy paint and mix in acrylic paint to add color for the frosting. 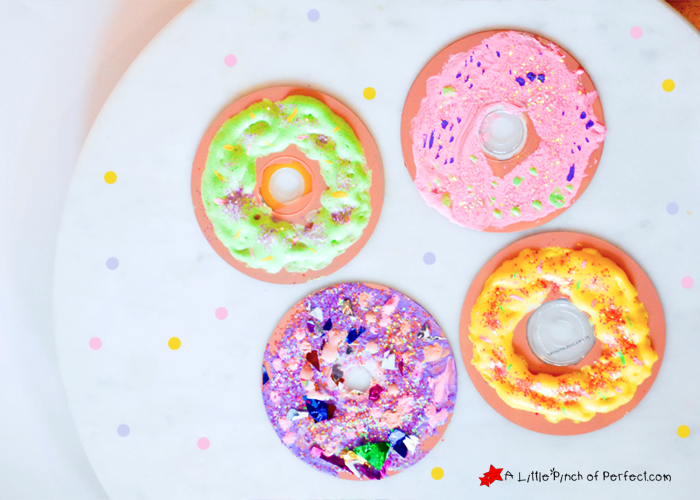 Paint it onto the doughnut, making sure to leave some of the edge brown (so you can tell it is a doughnut), and try to really glop it on if you want it to dry puffy. My daughter spread the puffy paint around like regular paint so it didn’t dry puffy…(still turned out super cute though :). 3. 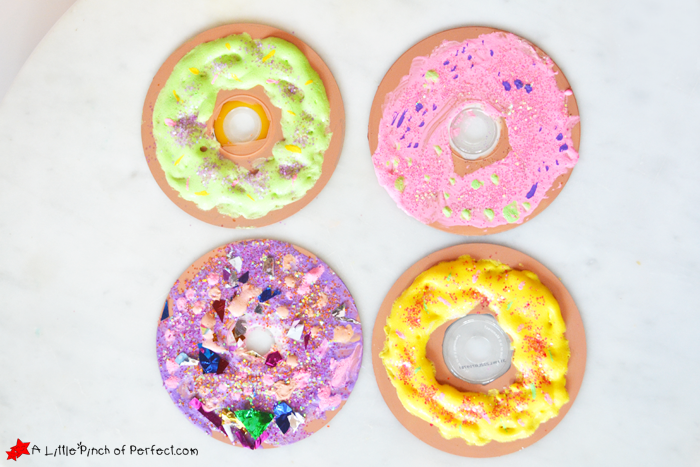 Sprinkle glitter on top and use the paint brush to paint sprinkles on. CD Cookies – Duckling Gets A Cookie? Thanks for crafting with us today! Please click here to sign up for our weekly newsletter and follow us on Facebook, Pinterest, Twitter. These are so cute! I just remembered to pull our our puffy paint that i'd kept hidden ! Also, Have you guys stopped the linky ? LOOOvVVEE!!!!! These!! Ok, I have to know where did you get those gorgeous unique sparkles/glitter! 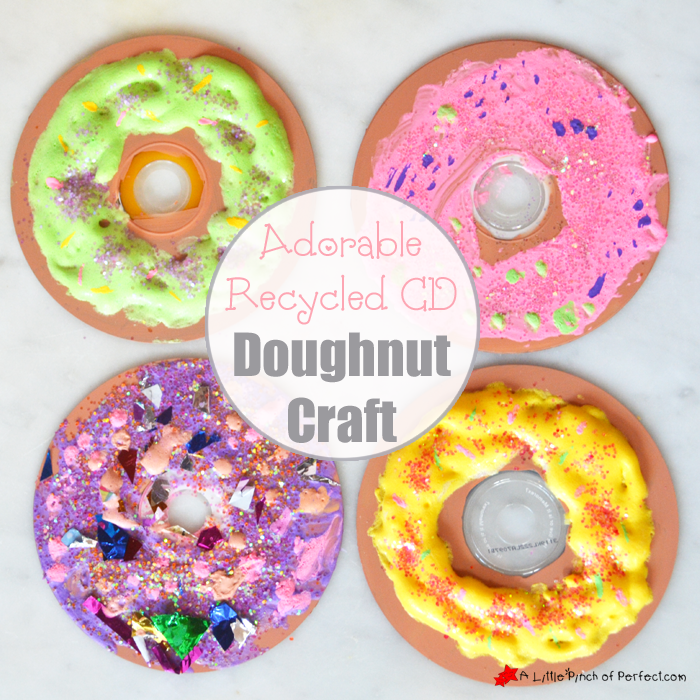 What a great idea, wonderful recycling for CDs because I never know what to do with them! 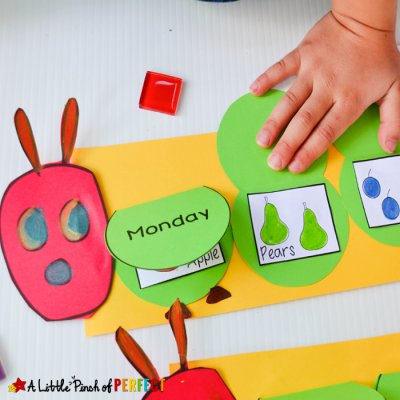 Really creative idea! It's practical, it's waste-free and it's yummy – what more to wish for!